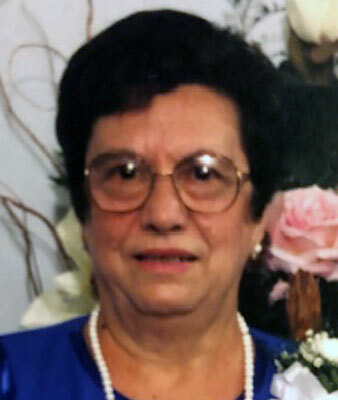 YOUNGSTOWN - Prayers will begin Friday at 12:15 p.m. at the Higgins-Reardon Funeral Homes, Austintown Chapel, followed by a Mass of Christian Burial at 1:00 p.m. at St. Christine Church for Domenica L. "Phyllis" Odoguardi, 88, who died Monday night at St. Elizabeth Hospital in Youngstown. Phyllis was born May 11, 1930, in Calabria, Italy, the daughter of Jerome and Margaret (Murano) Picierro. She came to the area in 1956 and worked in housekeeping at Assumption Village Nursing Home for 16 years. Phyllis loved to cook and enjoyed having her family over for Sunday dinners. In her spare time, she helped cook for Cherol's Banquet Hall. Phyllis' husband, Leonardo Odoguardi, whom she married Feb. 6, 1948, died Jan. 26, 1977. She is survived by her daughter, Laura (Tom) Basista of Boardman; son Joseph (Susan) Odoguardi of Dublin; daughter-in-law Kathy Odoguardi of Austintown; eight grandchildren, Tom (Jen) Basista, Marilyn (JR) Murray, Jeff (Rowena) Odoguardi, Amy (Greg) Iacofano, and Jenna, Jackie, Jillian and Joelle Odoguardi; and six great-grandchildren, Noah and Julia Basista, Jake and Aly Murray, and Nicholas and Ava Iacofano. Phyllis was also preceded in death by her parents; son Jerome F. Odoguardi and brother John Picierro. Family and friends may call Friday from 11 a.m. to 12:15 p.m. at the funeral home.